FILE - Chinese Premier Li Keqiang, right, walks past Chinese President Xi Jinping as they arrive to the Monument to the People's Heroes during a ceremony marking Martyr’s Day at Tiananmen Square in Beijing, Sept. 30, 2014. It has been more than three decades since Communist-ruled China established its current constitution, but now the document is getting newfound attention under the leadership of Chinese President Xi Jinping. At a recently concluded top-level meeting focused on building up the rule of law in China, the party announced a national day to celebrate the document would be held each year and officials will swear allegiance to it when they come into office. China’s constitution was established in 1982, when the Communist Party was opening up the country economically and trying to recover from a deadly and socially divisive Cultural Revolution. Now China is at a new crossroads. The county’s mega-growth years have passed and it is grappling with the massive transformation the past decade has brought, including by-products such as rampant corruption and environmental degradation, as it is reaches for a new economic growth model. “We are in a state of what we around here call 'trapeze economics.' That is, the system has to let go of one growth model in the faith that the next growth model is going to be right where it is meant to be,” said analyst David Kelly of Beijing-based research firm China Policy. He said building up the rule of law was important because investors needed to have legal guarantees for opportunities in China. “All of the mechanisms of a market economy are really needed more than ever. They were needed in 1982 and that is why there were changes in 1982,” said Kelly. China is not a market driven economy. It is an economy in which state-run companies enjoy advantages over the private sector. Government connections were key and jobs at state-owned enterprises were sought after, which was something the government did not want, Kelly added. “They want to have global companies that are like Google or Apple, but that does not happen without assurances that you can make it outside of the state sector,” he said. The party is also looking to change public sentiment by focusing on citizens’ rights. In a lengthy outline of legal reforms released late Tuesday, the Communist Party talks about the need to strengthen citizens’ basic privileges such as property rights, fair opportunities, fair rules and political rights. 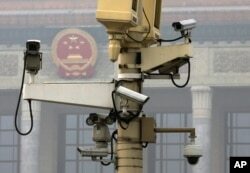 A pole attached with security cameras to monitor Tiananmen Square stands against a backdrop of the Chinese Communist Party emblem on the Great Hall of the People in Beijing, Oct. 20, 2014. Chinese President Xi Jinping said by 2020, China aimed to have completed its transformation into a country in which the rule of law was the norm and where trust in the judicial system was continually growing. He said basic human rights would be respected and guaranteed. William Nee, an Amnesty International China analyst in Hong Kong, said there was a deep hunger among the legal community and Chinese citizens for greater accountability and rule of law that was predictable and according to the constitution. “It does seem like they [the party] want to have some form of basic human rights to be implemented and that they want it to be done in the judiciary. At the same time they kind of want to monopolize the process so that it is the party that is guaranteeing human rights, and not as much putting mechanisms or restraints on political power, especially the party’s power,” he said. China’s President Xi Jinping has spoken about the importance of the constitution before, but he has also cracked down hard on dissent, silencing critics. China has detained at least 60 people for supporting the ongoing protests in Hong Kong, and next week in Beijing a filmmaker faces trial for a documentary on 100 years of constitutional governance in China. Rights lawyer Shang Baojun said he was skeptical authorities could take steps that guaranteed citizens rights. “Many of these legal guarantees already exist, but what we see continually are restrictions on citizens’ rights in the name of rule of law," Shang said. China’s constitution guarantees freedom of speech, the right of its citizens to run for office and to vote, as well as freedom of religion and public assembly.